As this Reuters photo shows, the robot players still have a lot to learn. At this time every year, Akihabara in central Tokyo plays host to an event that without fail sees someone proclaim that robots are poised to usurp us feeble humans and take over the world. The cause of the misplaced optimism is, as ever, a game of football between two non-flesh-and-blood teams. 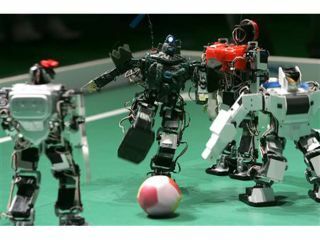 The ' Robot Sports Day 2007' is intended to be a fun event for hobbyists interested in small commercial robots such as Aibo and Gogic Five, but it is inevitably seized upon as a supposed showcase for the might of the machine. Unfortunately, the football match is anything but. Reuters captures the flavour of the game perfectly by pointing out how clumsy the various mechanoids appear on the pitch and even that several were being remotely controlled by owners. Still, none of that stops the attention-seeking organiser from making the outlandish claim that "... it's only a matter of time [before] they will catch up with humans and eventually outrun us ... just in the same way personal computers, which were slow and not up to par until just a few decades ago, can now perform various tasks much faster than humans." Putting aside the unfair expectations being heaped on current robots, after a difficult sporting week for British teams perhaps we've found one game where we might just have a chance.